Tarot readings are similar to horoscopes, but rather than using the celestial bodies to understand things, readers use a deck of tarot cards. The cards may also be used to access unconscious thoughts or feelings. Historians believe that tarot cards were first used as a game in northern Italy between 1420 and 1440. The original set of cards was created by taking a standard deck of cards and adding 21 trump cards, a fool, and four queens of each suit, for a total of 78 cards. They were called carte da trionfi (cards of the triumphs) and later became known as tarocchi. No documents speak of using tarot cards to read fortunes until the eighteenth century. The deck is divided into two individual parts .The trump cards are made up of 21 cards without suits and a card called The Fool. Cards will vary depending on the type of tarot cards used, but some of the cards that may be seen are The Magician, The Empress, The Lovers, The Hanged Man, and The Wheel of Fortune. This part is also known as the major arcane or “greater secrets”. The second part is the remaining 56 cards are divided up into four suits, of 10 cards each and 16 cards of four (page, knight, queen and king) per suit. The traditional four suits are swords, batons, coins and cups, although today swords are known generally as wands, rods, or staves and coins are called pentacles or disks. This part is also known as the minor arcane or “lesser secrets”. The practitioner will often shuffle the cards (or ask you to shuffle them), then lay them out in one of many patterns. He or she will then interpret what the cards reveal. The cards can be used to gain insight into the person’s feelings and desires. They can also be used to interpret an event that took place in the past, present or even future. You may notice that almost half of the cards during the reading are reversed. This can reverse or overturn a card’s meaning. For example, the Death card upright can mean change, while the Death card reversed shows stagnation. You can learn to do your own tarot reading. There is myth that a novice Tarot reader must receive his or her first deck of cards as a gift to avoid bad luck, but that is not true. It is usually preferable for you to purchase your own set of cards as it allows you to choose the style and artwork you like. There are even “beginner” decks where the meanings and symbolism are easier to learn. There are also many great introductory books for learning to read tarot cards. Before you begin a reading, make sure that you are comfortable with your cards. 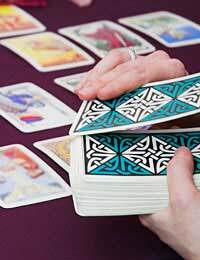 You should not use someone else’s tarot cards to do a reading, as they may have the other person’s psychic energy within them and the reading will not be accurate. You should keep your cards in a safe place, away from others. Tarot readings can be done as often as a person desires. For some people, once every five years may be enough. But others like to get a reading more frequently, as much as once every three or six months. The goal of a tarot reading is to make you feel more confident in yourself and comfortable in the decisions you make.